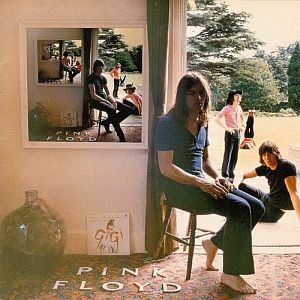 Ummagumma is an album that must be heard! Not that it is a masterpiece (actually far from it), but for its unique strangeness. A double album with the first being a live album of past glories in the form of 4 songs all of which meet or exceed their original studio workups. The second album gives half a side to each of the 4 members. Wright's SYSYPHUS is broken into 4 parts of keyboard experiments, of which 3 work well and 1 is just Wright banging around. Gilmour's The Narrow Way as an acoustic section, a rocking instrument section and ending with a laid back/vocal section. Parts of it will be worked on and polished up on Meddle. Roger Waters was allotted 2 songs: a folky Grandchester Meadows, which ends with a funny stereo testing of someone running stairs to get a paper to swat a fly. Several Species Of Small Furry Animals Gathered Together In A Cave And Grooving With A Pict, is an experimental tape effects laden tune with vocal help from Scottsman Ron Geesin of Atom Heart Mother fame. Bizarre would sum up this track. Nick Mason's The Grand Vizier's Garden Party never gets much respect but I like it alot. His 3 part instrumental starts with a flute intro from his wife Lindy and progresses into a fun tape effect / drum solo. I can't help it but again I like his piece the most! A taste that is not acquired; you either like this type of stuff or you do not. I want to give this 4 stars, especially for the live album and also for the mostly successful experimentation on the second. So I think I will!